Following in the footsteps of Franz Ferdinand, Noisettes, Sugababes and Paolo Nutini, super-cool London boys Athlete will headline the fourth RoAR show at The Warehouse, Aberdeen on Thursday 29th October. The Scottish Government’s ‘One Scotland’ campaign and Bauer Radio Events today reveal details of the final date on the Rock Against Racism 2009 tour. RoAR is a series of live music gigs that aim to celebrate Scotland’s multi-cultural society and help tackle racist attitudes. The free shows, featuring major chart acts, take place across Scotland in both established and more unusual venues. Racist attitudes and behaviour, intentional or not, have a negative impact on Scotland, the people living here, and how we are viewed by the rest of the world. RoAR, as part of the One Scotland campaign, reminds people that racism is wrong and detracts from the kind of Scotland we all want to live in. Since shooting to prominence seven years ago with their spirited blend of electro-tinged, indie-pop and the stunning Mercury-nominated debut album, ‘Vehicles And Animals’, Athlete have established themselves among the UK's finest songsmiths. The band have released three albums to date (the other two being 2005's ‘Tourist’ and 2007's ‘Beyond The Neighbourhood’); packed out venues across the land; picked up an Ivor Novello award; and topped both the UK's album and airplay charts. Their new album ‘Black Swan’, is a musical summary of everything Athlete have been through; the good, the bad and the ugly. But although its songs are packed with emotion, it certainly isn't a downbeat record. In fact, the album begins with the hurtling rush of glorious first single, ‘Superhuman Touch’, which catapults the album into life with the opening line, "I'm on fire and nothing's gonna hold me back". 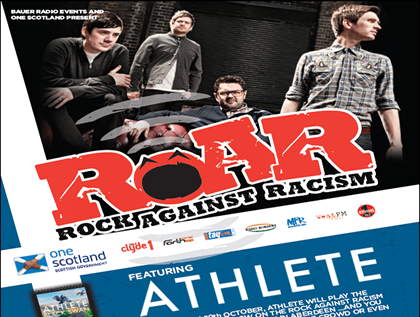 Tickets to RoAR with Athlete are FREE and available through Bauer Media competitions next week (Clyde 1, Forth One, MFR, Tay FM, Northsound 1, West FM & Radio Borders) and at www.RockAgainstRacism.info now. RoAR also gives unsigned bands and solo artists based in Scotland the chance to shine via its renowned ‘Talent Trawl’. Anyone who has aspirations to be the Next Big Thing can win the chance to open the show. For the chance to support Athlete, log onto www.rockagainstracism.info now. The competition is open to any unsigned musicians living in Scotland over the age of 16. The closing date for the support slot is Friday 16th October at 9am. Five finalists will be shortlisted ahead of each show and the eventual winner will be determined via an online public vote and announced on 23rd October. There is also the chance for members of the public to ‘have their say’ on the Rock Against Racism website and to take part in our national racism survey. The Scottish Government and Bauer Radio Events are calling on all Scots to log on NOW and get involved – to stand up and speak out against discrimination, celebrate our many cultures and help make our country a welcoming place that is free from prejudice.